I was looking through the latest issue of Lenswork magazine and read a feature on photographer Vivian Maier. During her lifetime, Maier took over 100,000 photos and never published any of them. Maier’s work was discovered by accident and has inspired a book, a documentary film and a website. Her street photography will no doubt inspire amateur photographers everywhere. Visit www.vivianmaier.com to see some of her photos. It’s been over two years since I purchased my Canon 5D and I’ve never cleaned the image sensor. I use my Giotto Rocket Air Blaster to blow out some of the dust every time I change a lens but over time you just end up blowing the dust around inside the camera. Eventually a proper cleaning is required from a technician or by using an Arctic Butterfly to remove the dust off the sensor. I get nervous about poking around inside my expensive camera and prefer to leave it to the experts. For $40, you can have a technician at Vistek clean your sensor until every last bit of dust is gone. Because mine had never been cleaned it took quite a while. So why is cleaning your image sensor such a big deal? When you start to see long strands of dust or black spots throughout your images, you know your image sensor is dirty. This can be removed by cloning parts of the image in Photoshop but the this digital dust removal takes time when you’re working on a final image. If I can save hours of post production work then it is totally worth it to me. If you’ve had a digital SLR camera for several years and never bothered to clean it then maybe it is time to get it cleaned professionally. I feel like I have a new camera again. The Scotiabank CONTACT Photography Festival is on for the entire month of May in Toronto. With over 1,000 local, national and international artists exhibiting at more than 200 venues you’re sure to find something that interests you. I love that CONTAC has released a mobile app that should make it easier to find some of the venues. It’s been a while since I had some time to plan a photography trip and this year I thought I would try some paddling out in Georgian Bay near Killarney Provincial Park. I hadn’t used a kayak in over 20 years but that wasn’t going to stop me from getting some photographs of windswept pines and rock pools surrounding by pink granite. After two trips to Mountain Equipment Co-op (MEC) in Toronto, I had a waterproof bag for my camera gear, a new compact stove, water purification tablets, paddling boots and all the requisite gear for camping on an island in Georgian Bay. My first night was spent in Killarney Provincial Park at the George Lake campground (view a Google map). At sunrise I did a quick hike to A. Y. Jackson Lake which was only 20 minutes from my campsite. It was overcast and foggy but the scenery was incredible. View a larger version of A. Y. Jackson Lake (first photo of my trip). I arranged ahead of time to rent a sea kayak from Killarney Outfitters. They delivered the kayak to the Chikanishing Creek boat launch (point A on the map below). I parked my car here, loaded up the kayak and paddled out into Georgian Bay with my waterproof map and compass in search of The Foxes (point B on the map below). After two hours of paddling and navigating I arrived at North Fox Island, exhausted (point B on the map above). View a Google map of this location. I can’t tell you how relieved I was to make it to this island without rolling my kayak. Along with some mink, I was the island’s only inhabitant for 3 days. The photographic opportunities on the North Fox Island and the surrounding Fox islands was incredible. The weather was outstanding and my camping was problem-free. I think I hiked around “my island” at least 4 times and at different times of the day as the light changed. I’ve never been at a location with so many options for making photos. If I tired of North Fox Island I just packed some water and food and headed over to one of the other Fox Islands for the afternoon. The quickest and possibly the best way to explore Georgian Bay for photography is by kayak. The landscape is simply stunning. I am blown away by the fact that a show as popular as House was filmed using a digital SLR. This is amazing! The Canon 5D Mark II can record up to 22 minutes of HD footage using an 18 GB memory card. The 5D retails for $2,449 on Amazon. I have the previous version of the 5D and would love to upgrade and find some video projects to work on. For another incredible demo of how good the video can look with this camera watch The Last Three Minutes - a short film by cinematographer Shane Hurlbut, the cinematographer of Terminator Salvation. Photographer Andrew Collett, is interviewed by Michael Reichmann for issue 19 of The Luminous Landscape Video Journal and it is excellent. It takes place at Collett’s gallery in Port Carling, Ontario where he shows some of his photography and discusses his canvas printmaking process. If you enjoy photography from the Muskoka Lakes and Georgian Bay then you’ll want to take a look at Collett’s photography. His printmaking process on canvas is really interesting and has become quite popular. This is one of the best segments to date on The Luminous Landscape Video Journal. Another interview on LLVJ 19 with Seth Resnick is also quite good (even if it does suffer from poor audio). Resnick is a successful stock photographer that offers up plenty of advice for photographers such as the importance of digital asset management, particularly keyword metadata. Great stuff. I noticed this hawk outside my kitchen window, sitting on the fence. I ran upstairs, grabbed my camera, threw on a telephoto lens and shot a few frames through the backdoor as he flew away. If you were to ask me if I liked birds, I would have to say, not really. Would I purchase a book on birds? Nope. I just spent 10 minutes looking at the amazing bird photography of Andrew Zuckerman. Just look at the detail and clarity of the snowy owl above. Amazing! David Eaves at Queen’s University has an interesting blog post on his experience of trying to enter the US - Closed Border, Closed Economy, Closing Opportunities. Work or pleasure? It’s never a good idea to say that you are going to the US for work. Your passport could be red-flagged, you could be delayed at the border or in Eaves’ case, your work visa can be taken away. A couple of years ago I went to Vermont for the weekend to take photos of the fall foliage. The border guard wanted to know if I was working on an assignment. I told her that I was an amateur photographer, a hobbyist. She was skeptical and asked me if I was going to be selling my photos. I knew better and told her that I wasn’t going to be selling my photos. After a few more questions I was free to enter New York state. I think that this year I will stay in Ontario and go to Algonquin Park instead. I’m not at all familiar with Dave Hill’s HDR photography but you can get a good overview at Abduzeedo. Be sure to check out the behind the scenes video. Great stuff. You can also take a look at Dave Hill Photography but unfortunately his Flash site often seems to choke and doesn’t load. Man, do I hate Flash sites. I was going through some of my photos from last summer and somehow missed this photo of Recollet Falls on the French River. There’s a nice symmetry to the photo that I had overlooked. Recollet Falls is a short hike (1.75 km) from the French River Visitor Centre on Hwy 69 (halfway between Parry Sound and Sudbury). If you’re heading up to Killarney Provincial Park or going further north you should try and visit this spot. I’m planning to spend another week in Lake Superior Provincial Park this summer and do nothing but landscape photography. I shot the cover for the 2009 Harvest Ontario book. You can grab a copy at any Home Hardware in Ontario. Harvest Ontario is a great guide for local food markets, wineries, fairs, and B&Bs. Visit Harvest Canada for an online version of the book and more information. Once you start looking at Awkward Family Photos you won’t be able to stop. You’ll laugh at the embarrassing portraits and chuckle at the clever captions. Enjoy. Yves Marchand & Romain Meffre Photography has an interesting portfolio of work called The Ruins Of Detroit. It features some incredible photos of places in the city that are vacant and have been for some time. I drive through Detroit a couple of times each year and have always thought that it would be great to shoot some of the vacant spaces in the city. I wonder how safe that would be? I’m thinking I should organize a weekend trip to the motor city with some big guys like Tim, Neal, and Paul. I find Michael Levin’s black and white photographs to be quite stunning. Many of his photos are long exposures that are carefully framed creating simplified landscapes. Kanye West and his entourage are a stylin’ bunch. View larger photo. I’ve been wanting to make a photo like this since last July. This morning at 5:30 AM I decided to head off to Niagara Falls and try my luck at sunrise. By 8 AM I was frozen by the Falls but I had my images. The clouds weren’t spectacular but I wasn’t about to go away with a blank memory card. Traffic accidents on the QEW delayed my trip back to Toronto and messed up a few of my appointments but that’s another story. Larger image on Bombippy Photos. Today it is a friend’s birthday. He’s 39 years old, works at a video game company, and he gave this website its name. Vanity Fair has put together an interesting list of the 25 best news photographs. I can’t get this image out of my head. James Nachtwey is something of a saint in the photography world. In 2007, Nachtwey won the TED Prize — $100,000 and one wish to change the world. The result is XDRTB.org. XDR-TB (extremely drug-resistant tuberculosis) is a new and deadly mutation of tuberculosis. XDRTB.org tells the story of XDR-TB through Nachtwey’s powerful photographs. Visit the site. Watch the video and find out more. XDRTB.org also has the full video of Nachtwey’s TED Prize wish — powerful and inspiring stuff from a great photographer and humanitarian. If you don’t understand who James Nachtwey is and why I’m going on about him just watch the video. Better yet, find a copy of War Photographer (2001) and watch that. Based on a positive review by Michael Reichmann at Luminous Landscapes I purchased an Induro AX214 tripod to replace my older Manfrotto 190CLB. After a week of shooting I have a few observations about tripods, ballheads and camera plates. I went with the aluminum alloy model instead of a carbon fibre model due to cost. I’d love to have a carbon fibre tripod but they’re expensive and my photography is more of a hobby and less of a profession. In hindsight, it was a mistake to get the compact model with 4 leg sections instead of 3. When you have to extend the legs for the 40th time on a 4 hour hike, you’ll wish the tripod had 3 leg sections, not 4. When fully extended, the Induro AX214 is 65.8 inches high which puts my Canon 5D right at eye level —Â great for set up. I would have done better to get a tripod with 3 leg sections that measure the same height for faster setup. 3 leg sections are also sturdier than 4. Induro gives you a really nice carrying case and strap. Also included is a wrench and replacement feet for different terrain. Nice touch. A standard bubble level is built into the top plate of the tripod along with a compass. I found the compass to be a useful in terms of predicting exactly where the sun was going to rise and set. For some reason Michael Reichmann thought it was “a real bit of silliness that should be removed on the tripod’s next iteration”. And I thought I sometimes sound a bit elitist. Sheesh! The rubber grip leg locks are easy to rotate when you need to extend the leg sections. Reviews indicate that the construction here is better than Gitzo’s tripods. Occasionally I found that the smallest leg section was difficult to lock (it just kept turning). This would result in the tripod leg collapsing while framing a photo. Very frustrating. My advice is to stay away from tripods with 4 leg sections. The adjustable angle leg locks are a breeze to use and nicely designed. The rubber tripod feet are interchangeable with metal spike feet (included). Make sure you use the wrench that is provided and tighten the feet to the legs. I lost one in Lake Ontario. Luckily Vistek replaced it free of charge. This is an entry-level ballhead with a dual locking system that I found frustrating to use. The quick release system hurts your fingers and just feels clumsy. I also found that the ballhead would move slightly just before it was completed locked into place.I needed something with better ergonomics and more precision which is why I upgraded almost immediately. The Induro DM01 Ballhead has all of the features you’d expect in a pro level ballhead — manual drag control, smooth panning, quick release plates. I had to constantly tighten the quick release plate which was constantly coming loose and causing my camera to move on the tripod when the ballhead was locked in place. This was extremely frustrating and apparently a common problem when your camera plate has a rubber or cork pad. I’m going to continue using my Induro tripod and resist the urge to switch to an expensive Gitzo tripod. I think that the Induro ballheads could be better if they had a better camera plate that didn’t come loose so easily. A Really Right Stuff ballhead (BH-55 LR) with a camera body mounting plate would solve my problems with the Induro ballheads. Really Right Stuff make the best ballheads on the market today but they are very expensive. Everyone that owns one says they are worth the money and like many things you get what you pay for. I posted 14 new photos on Bombippy Photos from my northern Ontario trip. I’ll be posting more in the coming week as well as a review of my Induro tripod and head. My photography road trip was better was better than expected with Lake Superior Provincial Park being the big surprise. If landscape photography is your thing then this park is a must stop on your travels. I camped at the southern end of the park in Agawa Bay. The Trans-Canada Highway (Hwy 17) takes you to the north end of the park in less than an hour but in between are an endless choice of trails, lakes, waterfalls, valleys and rugged coastline to photograph. Every trail and location I visited was more impressive than the last. Each of these locations was never more than 10-20 minutes apart which is astonishing when you consider that you can drive for hours across Ontario without the landscape changing very much. The close proximity of trails, coves, and scenic lookouts is perfect for the photographer that wants to shoot multiple locations in a morning or evening. If it was raining at the north end of the park I was able to travel south for 30 minutes where I had perfect conditions for an 8 km hike. Some of the coves had strong mist and fog in the mornings but if you travelled north 10 minutes you had warm morning light. Incredible. Killarney Provincial Park was equally as impressive but much of the park is only accessible by canoe. I hiked the Chikanishing Trail and the Tar Vat Trail out of Killarney and plan to return to explore some of the trails in the park. Recollet Falls on the French River was a short 3 km hike and a great way to start my trip. At the end of my trip on my way back to Toronto I stopped in at Killbear Provincial Park (just north of Parry Sound). This park was a huge disappointment because of the number of visitors, the litter, the graffiti on the rocks, the barking dogs and the underage kids drinking on the rocks. It was if somebody took the Beaches neighbourhood in Toronto and dropped it in Georgian Bay — not what I expected. I was planning to take a photography trip down to the Bay of Fundy and Prince Edward Island but changed my mind. One week isn’t nearly long enough to explore this part of the country. I didn’t buy them from the store. I went home and ordered them online at chapters.indigo.ca for 34% off and had them delivered to my door. Amazon.ca didn’t have any of these books in stock and seems to be hopeless at having anything in stock these days. I’ve been poring over these books of the Georgian Bay coast and northern Ontario. My goal is to shoot some coastal landscapes for a week. Why go all the way to the east coast when I can visit the old stomping grounds of the Group of Seven? I plan to visit Recollet Falls on the French River, Killarney Provincial Park and Lake Superior Provincial Park. I’ll camp along the way and scout locations during the day for morning and evening shoots. It won’t be much of a holiday. Getting up at 5 AM and going to bed well after sunset doesn’t leave a lot of room for sleep but it beats working on websites. I’m looking forward to dusting off the Canon 5D and creating some landscape photos for a change. On June 16 I’m going to attend the Photoshop CS3 for Photographers Tour at the Metro Toronto Convention Centre. I need to get out of the home office and learn something new, anything. I prefer to shoot landscapes instead of people but I found Joerg Colberg’s blog entry, “What makes a great portrait?” to be an interesting read. Instead of giving us an opinion, Colberg asked fine art and commercial photographers, curators, editors and others to explain what makes a great portrait. A lot of people submitted photos with explanations that are really quite interesting. If you own a DSLR then sooner or later you’re going to get asked to shoot a portrait. This article may give you some handy tips. A lot of people thought that Version 2.0 of Apple’s Aperture would be released at the annual PMA conference and trade show this week. It wasn’t and people are grumbling. What’s taking so long? Photoshop Lightroom is Aperture’s competition and what I use or rather don’t really use. A lot of people love Lightroom and use it for all of their photography needs but I’m not one of them. What I’m hearing is that neither Aperture nor Lightroom has taken hold with this crowd. At least three photographers I spoke with said that they bought both products, and that they aren’t really using either one. This year, more people seem to be comfortable with the Photoshop-Bridge-Adobe Camera Raw workflow—thanks to the rock-solid release of Photoshop CS3 last spring—and there are real questions about Apple’s place in this market. Apple says they are working on version 2 of Aperture and that it will have some great new features. I think it will have to have a lot of great new features if it will make it to version 3. Yesterday, Sony announced the development of a 25 MP 35mm full frame sensor that will give Canon a run for its money in the full frame DSLR market. It’s rumoured that Nikon is going to release a 24 MP full frame camera later in the year. All of a sudden my full frame Canon 5D with a 12.8 MP sensor doesn’t seem so impressive but it doesn’t matter. It’s easy to get caught up in the megapixel and megabyte race and wanting the latest gear but it’s meaningless. You can have the greatest camera gear in the world and still be a terrible photographer. PhotographyVoter is a collaborative website which allows it’s community to submit and vote on photography related articles, tutorials and resources. The perfect fix for photography info when you’ve checked all of your photo sites for updates. I’m always amazed at photography sites that have small images where you need a loupe to actually view them. Worse is when you click on a thumbnail image to get a photo that is slightly larger. Talk about frustrating. Jeremy Cowart or whoever designed his site has done a fabulous job. I was watching an interview of photographer Clyde Butcher in one of The Luminous Landscape video journals that might be of interest to the photographers out there. Butcher, a black and white landscape photographer will spend a day or two burning and dodging an image in Photoshop and make up to 7 prints before he has a master print. haven’t been 40 years in the darkroom. They don’t know what a good print looks like. If you don’t know what a good black and white looks like, you can’t do it with ink jet or silver. So it doesn’t matter what the media is if you don’t understand what you’re doing. So how do you know what a good black and white print looks like? I think the simple answer is to visit a gallery. Find out what an Ansel Adams print looks like, up close. Last year I had a chance to see some of Adams’ photographs when an exhibition of his work came to the AGO in Toronto. The prints were spectacular and much different from the small reproductions in many books of his work. Another way to see what great black and white photography looks like? Purchase the latest copy of LensWork magazine — some of the best black and white prints in your book store. Aside from taking a course or a workshop, I think the best way to improve the quality of your black and white prints is to visit a gallery and see what a professional photographer’s work looks like. If you’re at all like me love photography books then BookCloseouts.com has some incredible bargains for you. I couldn’t believe how many of the books that I own were available on this site for 50-70% off. With the markup in Canadian books the discounts are even greater. This isn’t Amazon.com but for Photograpy books, this should be your first stop when shopping. For books on cooking, food and wine then you’ll definitely want to check out this site. They are offering an additional 25% of their ridiculously cheap prices. If that isn’t enough to convince you, then use the online promo code road and password bookcloseouts.com to receive $5 US off your order of $35 US or more. Unbelievable. There are many popular photography spots in the US that have been snapped thousdands of times. When I visited a covered bridge in Vermont, I was amazed at how many people came by in the span of an hour to take a picture. I haven’t been to The Most Photographed Barn in America but it’s incredible how many photographers have been. Just about every morning there are tripods being set up at Moulton Barn near Grand Teton National Park where amateurs and pros are looking for that perfect postcard photo. Flickr is great for providing landscape photographers interesting shooting locations. I don’t think that there is anything wrong with shooting something that thousands of people have photographed before. The light is always changing and you can always look for a new ways to shoot a popular location. 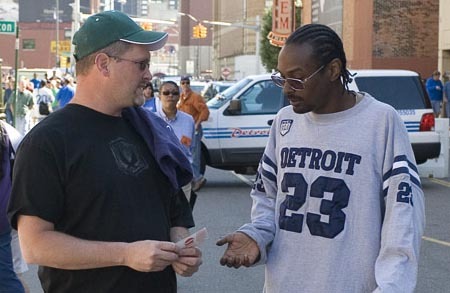 Here’s a photo of my buddy Paul trying to sell some Detroit Lions tickets to a scalper. This guy’s look reminds me of little of Snoop Dogg. When Paul told him the price, Snoop complained and said it was too high. Then he complained to tell Paul that he has kids to feed, that he needs to make a living. Paul’s response was that he has kids too. Four of them! Maybe Paul can tell us how the deal went down. All I know is that it made for a good photo. 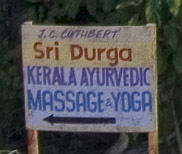 At the bottom of my street, Mike Myers is working on his new film, The Love Guru (2008). The Scarborough Bluffs is standing in for a village in India. A small village has been created on one of the beaches in Bluffers Park, Scarborough. I have photos of The Love Guru set on Flickr. In the comedy, The Love Guru (Mike Myers), Pitka is an American who was left at the gates of an ashram in India as a child and raised by gurus. He moves back to the U.S. to seek fame and fortune in the world of self-help and spirituality, specializing in settling intimacy issues between couples. His unorthodox methods are put to the test when he must settle a rift between major league star hockey player Darren Roanoke (Romany Malco) and his estranged wife. After the split, Roanoke’s wife starts dating the star member of a rival team, out of revenge, sending her husband into a major professional skid — to the horror of the team’s owner Jane Bullard (Jessica Alba) and Coach Cherkov (Verne Troyer). Pitka must return the couple to marital nirvana and get Roanoke back on his game so the team can break the 40-year-old “Bullard Curse” and win the championship. Only Mike Myers would find a way to work former Maple Leafs owner, Harold Ballard into a film. They’ve been filming at Pearson International airport, Riverdale and at the Air Canada Centre over the last few weeks. I think they are finished filming at the Bluffs for now. The Love Guru will be relased next summer on June 20, 2008. Nikon announced some new cameras that will surely heat up the digital SLR wars. They finally released a full-frame camera â€” Nikon D3. It looks like this is the direct competitor to the Canon 5D. One of the nicest features of the new Nikon is the 3” screen and an HDMI output. A virtual horizon function is a nice touch. Goodbye spirit level. Also announced was the Nikon D300. It’s been a while since Canon and Nikon had some major announcements like this. Yesterday Canon announced the long awaited 40D digital SLR. Also announced was the Canon 1Ds MKIII, and the Canon EF 14 mm F2.8 L II USM. More info on Luminous Landscapes or Digital Camera Reviews. I considered holding out for a Canon 40D but decided to get a Canon 5D last month when the rebate offer was extended. Now that the new cameras have been announced, I have to say that I’m quite content with my old 5D. Marcio Simnch Photography has a really simple interface for viewing photos. I love the simplicity. I’m enjoying the latest Wilco album/disc (or iTunes download in my case) â€” Sky Blue Sky. I also like that the band chose to use Manuel Presti’s photograph Sky Chase for the album cover of Sky Blue Sky. The peregrine falcon swooping into a flock of starlings over Rome was chosen as the best photo out of 17,000 and gave Presti the 2005 Wildlife Photographer of the Year award. I’ve been a little wrapped up with work in the past couple of weeks. Instead of rushing off to the office this morning and sifting through email I decided to drive out to Oakville. I picked up a couple of photography books on Friday and one of them suggested that Trillium Trail in Bronte Creek Provincial Park is a great spot to shoot Trilliums. Unfortunately, the flowers were past their peak but there were plenty of photo opportunities. It felt good to get out and shoot some photos, even if it was for only for 90 minutes. I haven’t picked up the camera in a while and look forward to getting out and taking more photos. The home renovation has started and stalled. If you don’t read stuffandjunk then you’re finding out now that we’re doing a home renovation. It started with me wanting a home office. When the dust settles, we’ll have a garage, a completely renovated and larger ground floor and a brand new second floor (with a home office in the back overlooking the backyard). Soon, very soon we’re going to get a final budget from the contractor and they’ll start digging. Soon! Really soon! I’ve been hearing this for almost two weeks now and am losing faith that I’ll have a home office before September. July 17 was the original date of completion. I have about ten movie reviews waiting that need to be written and two Livebait.tv stories to be edited. The last Livebait story we did was about Hot Docs. I interviewed James and couple of his friends about the film festival. If you’re at all interested in documentary films and didn’t get to Hot Docs this year then watch the latest episode. Flak Photo is a daily photography blogzine featuring distinctive work from an international community of contributors. It aims to promote interesting visual approaches to seeing the world and celebrates the art of exhibiting quality photography on the web. Bookmarked. This is a great site with a lot of links to some great photography. I was surprised to see a new Canadian magazine on the newsstand called Outdoor Photography Canada. It’s very similar to Outdoor Photography from the UK but with a Canadian perspective. If you have an interest in Canadian landscape photography then you won’t want to miss an issue. I’m reading The DAM Book, Peter Krogh’s excellent book on Digital Asset Management for photographers. He suggests that you use Adobe Bridge and iView MediaPro to manage your digital photos. But what about Adobe Lightoom and Apple Aperture? When Krogh’s DAM book was published in 2006, Adobe Lightroom was still in beta and Adobe Photoshop CS3 was still in development. To make matters even more confusing, Microsoft purchased iView MediaPro recently. I did a search for ‘lightroom vs bridge’ and found an interesting Q & A with Photoshop expert Scott Kelby. He suggests that you don’t use Bridge and Camera Raw! I think Lightroom is significantly better than the Bridge for importing, sorting, comparing, adding keywords, editing metadata, viewing photos, andâ€¦wellâ€¦I can’t think of anything the Bridge really does better for photographers than what the Library module of Lightroom does. …if you are a single computer user, without a large economic stake in your images, who does not already have some kind of DAM implemented, then Lightroom is probably just fine. Krogh suggests that there are some problems with version 1 of Lightroom in terms of bugs and features that were left out due to time constraints. I can live with that. Lightroom is a product that will improve with time. I’d rather put my money behind an Adobe product than a Microsoft one that might not be supported on the Macintosh in 5 years. The great thing about Krogh’s book is that you can apply his workflow methods to various software applications like Lightroom or even Aperture. So should you use Adobe Bridge and iView Media Pro as Krogh suggests? Or should you listen to Scott Kelby and go with Lightroom? My money is on Adobe Lightroom. It’s been almost two months two months since I’ve ventured out to take some photos. Work has been extremely busy. Last Friday we had 4 cm of snow overnight. On Saturday the temperature began to rise and I thought this would be a good opportunity to get out and shoot in the Hamilton area. I grabbed the 7-year-old, bribed him with some Captain Underpants books at Chapters and headed for Steel Town. I only had time for two locations â€” Waterdown Falls and Chedoke Falls. Some of the photos from this trip are now on BOMBIPPY PHOTOS. To get to Chedoke Falls you have to hop a fence and slide down a very steep, 70 foot slope. Not easy to do when when the slope is covered in ice and you’re trying to make sure your 7-year-old tumbles down into a tree or the rocks below. The gorge at Chedoke Falls is spectacular. Because it is difficult to get to, you won’t have to worry about hikers, tourists, or other photographers getting in the way. Great location. I found this location in a book called Waterfalls of Ontario. It’s a fabulous resource with great directions and photos by George Fischer. I’ll be using this book a lot in the coming months to explore some of the other waterfalls in the Golden Horseshoe. If you’re a photographer then you’ll want to have a look at Michael Reichmann’s short essay on Understanding the Art of Cropping at the Luminous Landscape website. It basically comes down to understanding what your photo is about. Once you understand and can articulate what a photo is about, the cropping should assist in the interpretation of the image, making it a stronger photo. Just read the essay if you want to print better photos. Indiana County Parks and Trails in west-central Pennsylvania is featuring one of my photos on their homepageâ€”yellow leaf in the snow. Back in June I photographed some Asiatic lilies and posted them on Bombippy Photos. Earlier this week I was asked by another blogger if she could use my photo in a review of Serge Lutens Un Lys fragrance. Thanks to Robin at Now Smell This for the photo credit. Now Smell This is a blog about perfume with current reviews, an extensive list of perfume houses and links to perfume-related sites. War Photographer (2001) is a fabulous documentary film about photographer, James Nachtwey. The filmmakers attached a small video camera to the end of Nachtwey’s Canon lens, letting us see what he sees in places like The West Bank, Kosovo, and Rhwanda. Nachtwey’s whole life is devoted to photography. He constantly puts himself in danger to get ‘the shot’. Last Friday I hopped in the ol’ Mustang at 4 AM. Destination, Vermont. The ‘lovely’ was nice enough to let me leave for three days to take photos in the Green Mountain State. The fall foliage was at its peak in many spots and I was determined to see as much as possible. Aside from the amazing colour of the leaves, there were plenty of waterfalls and covered bridges to shoot. 1,800 km later I’d been through the entire state, top to bottom, shooting each day from sunrise to sunset. If you’ve never been to Vermont in the autumn, you’re missing out. The landscape is incredible. The most picturesque town I passed through was East Manchester. I’m hoping to get down there next year for the first week of October (with ‘the lovely’ this time). Don’t take your 18-year-old Mustang GT (with 234,000 km) on an a 3-day road trip. You might get to your destination faster but your dashboard and tail lights could fail. Mine failed one day into the trip. Try to find a motel while there is still daylight. I ended up in Waitsfield, VT on Saturday night. When I left in the morning I noticed that the motel sign read, “bikers welcome”. If you’re going to do some mountain climbing, don’t wear loafers that slip on wet rocks. I climbed to the top of Smuggler’s Notch just north of Stowe, VT. Breathtaking. Literally. By the time I reached the bottom of my climb, my legs were shaking, my knees hurt and I wanted to vomit. I’ll be posting some photos on Bombippy Photos soon. If you’ve been to Vermont, what are some of favourite places you’ve been to? Last week, Canon announced the Digital Rebel XTi (400D) and the specs of this new camera are very impressive. I bought a Digital Rebel XT (350D) last year and I love it but this new offering from Canon has me depressed. The Rebel XT is an entry level digital SLR camera. I was thinking of upgrading to a low-end professional camera — Canon EOS 30D. I’m depressed because Canon’s update to the Digital Rebel makes it better than the 30D in many ways. Why would anyone bother purchasing an EOS 30D at this point? It will be at least another year before Canon updates the 30D to something worth looking at. What I would really like to get is a Canon EOS 5D with a full-frame sensor — perfect for landscape photography. Unfortunately I don’t have an extra $3,799.00 to spend on a hobby that makes a little bit of money. The August issue of Photography Monthly magazine has a great article on digital photography workflow. It assumes you’re using Adobe Photoshop CS2 and The Bridge to manage/edit your photos (which I do). If you’re unfamiliar with Adobe’s Bridge software then visit The Radiant Vista. They have an excellent video tutorial called A Photoshop Reference: Adobe Bridge. I’ve looked briefly at Apple’s Aperture and iPhoto, Adobe’s Lightroom, iView MediaPro and Extensis Portfolio 8 to manage my photos. Adobe’s Bridge software comes with Photoshop CS2 and does everything I need it too so I’m going to stick with that for now. There are few photography contests that I’m thinking about entering. If you’re an amateur photographer then have a look at these contests and submit your work. The competition is in its 3rd year and presented by The Nature of Things with David Suzuki and the Planet in Focus International Environmental Film & Video Festival. Photo Life magazine’s international photo contest has more than $50,000 in prizes. Categories include: the earth, the people, their lives. Sponsored by Gentec International (Sigma, Roots). Several themes which include: seascapes, ice, traffic jams, mountain paths, and self portraits. The Molson Grand Prix of Toronto has a Super Photo Pass that allows photographers to view all of the races from pit lane and beside the track at several locations. You get to shoot alongside the pros and view the cars up close. Any race fans/amatuer photographers interested in shooting the races this year? There is some more info at The Luminous Landscape website. If you’re interested in going then send me an email. Reuters is reporting that Canon Inc. might stop making film-based cameras. Nikon recently announced that it wasn’t going to make film camera’s any more except for a few high-end models. This news probably has a lot of ‘purist photographers’ worried and hoarding film stock. I’ve read enough comments from professional photographers who’ve embraced digital SLRs. Digital photography is already great and is only going to get better down the road. If you want to see some great photography from around the world then check out the finalists for 2006 Photobloggies. Winners will be announced next Monday. A couple of nights ago I went down to the Cherry Street to shoot some photos of the Toronto skyline. There are always a handful of photographers there but one guy stood out. He was shooting with a Nikon D70 and said he didn’t like the “idiot cameras” — cameras that are completely automatic and don’t have interchangeable lenses. He looked at my tripod and said he left his at home because he felt it was too windy. I’m not a professional photographer by any means but how can you shoot landscape photos without a tripod? Whatever. While this guy was going on about Nikon cameras and their great battery-life he would fire off 5 ‘snapshots’ at a time. I think he liked the sound of the shutter because he would point the camera randomly and continue firing off shots. He boasted that he took 50,000 photos with another Nikon D70 before the shutter broke. I looked at his camera and noticed that he didn’t have a filter on his lens to protect it. A few moments later, just as the light was getting interesting he left. He said it was too cold and windy to be out here shooting pictures. 50,000 photos! This guy was a little odd to say the least. If you’re like me, you’ve probably only seen a sand storm in a Hollywood film. A blog called Pruned has some amazing photos of a sand storm and a few other links to some interesting photos. Cool stuff or should I say “great distractions” to help you procrastinate take a break from your mountain of work. Occasionally I check my site statistics to see how much traffic I’m getting, how people are linking to my sites, etc. I noticed that BOMBIPPY PHOTOS was getting a lot of traffic from nexopia.com and xanga.com. Several users at nexopia (teenagers) were hijacking my photos. Users like science*time, afrodeeziak, dodad15, and hollisinheaven liked my images so much they put them on their sites without asking me. I suppose I should be flattered but I’m not. I changed the .htaccess file on all of my sites to prevent outside linking of images and bandwidth theft. I’m also going to make it a habit of watermarking all of my images with BOMBIPPY PHOTOS. I’ve been avoiding this because I felt the images look better without it. Now, it looks like this will be a necessary part of my workflow when posting new photos. The Toronto Free Gallery has IN TRANSIT—a gallery exhibit that captures Toronto on the move. It features the work of 25 photobloggers. I went on Saturday and was impressed with the work I saw. I never thought of the subway and streetcars as a theme for a photo shoot. I left the gallery inspired and plan to ride the rails for a day in search of some photo opportunities. If you’re in town then don’t miss this show at 660 Queen Street East. Sam Javanrouh is giving a lecture on Wednesday at Hart House in Toronto. He’ll be discussing some of the photos from his photoblog daily dose of imagery. Could be interesting. More information here. Olympus has announced a 7.1 MP camera that has a true live view on it’s LCD screen. A lot of smaller, consumer DSLR cameras have this feature whereas prosumer and pro cameras don’t—you look through the viewfinder instead. Whenever someone (who is not a photographer) looks at my Canon EOS 350D camera they ask why the LCD panel doesn’t work. I just figured that live view was a low-end feature. No real photographer would ever use such a feature. Would they? I wonder how long it will be before Canon and Niko add this along with video to their high-end cameras. With the weather in Toronto dipping down to -9 degrees Celsius, I could use a pair of these gloves from Axes Quin. At $47 USD I think I’ll just stay inside and take some macro shots instead. For the amateur photographer, The Radiant Vista is an absolute gold mine of useful information. If you have a few months of experience using a a digital SLR then visit their website. If you’ve read a gazillion British photography magazines but crave more information, then visit their website to lear even more. The Radiant Vista has 40 minute QuickTime video tutorials on night photography, composition and more. There is a daily critique of photos submitted from around the world which is also in video format. The best part about this site is that all of this information is free. Thanks to David for the link. Big changes in the photography world are ahead for the next year. Konica Minolta is withdrawing from the photo and camera business. They just signed an agreement in July of 2005 to make cameras with Sony. Pentax has teamed up with Samsung to develop a new generation of digital cameras. Olympus formed an alliance with Panasonic to do the same. Last week, Nikon announced that they were going to abandon film cameras and focus on marketing digital cameras. Canon maintains a strangehold on the digital SLR market and keeps raising the bar with new models like the 12 megapixel EOS 5D. If 12 megapixels isn’t enough resolution for you then consider the new Hasselblad H2d-39—the first 39 megapixel digital camera on the market. It’s only $40,000. Arnaud Frich has taken some amazing panoramic photographs of Paris. I think I mentioned his work a while back. If not then you have to take a look at some of his photos. They are spectacular. Ron Bigelow Photography has some great articles on digital photography. He covers sharpening techniques, exposure, composition, light and the camera RAW. The site won’t win any design awards but the photography information is invaluable. There are plenty of examples and to explain concepts and techniques. If you’re an amateur photographer then this site is for you. Wow! I just came across this online magazine that has tonnes of panoramas and virtula tours using QuickTime VR (QTVR). This isn’t anything new. I first dabbled in QTVR in 1992 at York University but the presentation of this content has vastly improved. When I was in Paris this spring, I wanted to visit Père-Lachaise Cemetery but ran out of time. A lot of famous people are buried there and there and it is a great place to take some interesting pictures. If you’re going to be in Paris and are considering this cemetery then check out this amazing virtual tour. The panoramas atop the Matterhorn are also pretty spectacular. I had no idea that QTVR was still this popular. On Sunday I went to the CNE Air Show in Toronto. I was supposed to meet up with a friend of mine but he was too hung-over and didn’t show up. That’s okay though, because his brother and his father were there and we had a good time without him. Neal, I hope you had fun at your party because you missed a great air show. You can view a few pics on Bombippy Photos. Oh, and I hope you made it to the bathroom this time. If not, then best of luck scrubbing down those walls and the floors. Skål! Last weekend I went to the GFS Marketplace 400 race at the Michigan International Speedway (MIS) in Brooklyn, Michigan. Some photos from this trip have been posted on BOMBIPPY PHOTOS. Jeremy Mayfield won the race (first win of the season). Jeff Gordon had a terrible day, much to the delight of the fans at MIS. Paul Tracy didn’t compete but will likely enter a future race and make the switch from Cart to Nascar next year. Give your digital photos that Poloroid look by using the Polaroid-o-nizerâ„¢. OpenRAW is a website that addresses the problems associated with the RAW file format for digital cameras. Canon, Nikon, every digital camera maker has their own proprietary file format which can cause headaches for digital camera owners. When PhotoShop CS2 came out last month, they didn’t have RAW support for my Canon Digital Rebel XT camera. In late May, Adobe upgraded their Camera Raw 3.1 plug-in to support the Rebel XT and a few other cameras. The point is that a standard file format or spec for RAW would be the best solution for everyone so that photographers can access their images in the future. Adobe has proposed the Digital Negative (DNG) format. Is anyone using this file format to archive their images? Tomorrow morning at 6:30 AM I’m going on my first photo shoot. Paid photo shoot. No, I’m not taking photos of a sunrise or doing any nature photography. That would be fun. I’m heading out to a lab in Oshawa. I’ll be taking a couple of hundred photos of three audio systems that are going into a new SUV model. Yeah, not so glamourous but I get to take pictures for a half a day and that makes me happy. Somehow I found 3 hours on Friday night to attend a photography course at Henry’s—Advanced Exposure Techniques. Great course. I’m one of those people that always used the automatic settings on my Canon Rebel SLR film camera until I made the switch to digital—Canon Digital Rebel XT. Being able to review my photos immediately on an LCD screen allows me to be more creative and experiement. Having a better understanding of exposure mechanics has helped me a great deal in taking better pictures (okay debatable). Finding the time to take photos is my biggest challenge at the moment. The only way I’m going to improve is by taking a lot more photos and learn from my mistakes. At the moment I can’t get enough of British photography magazines. There seems to be an endless supply of them on the newstands and I’m slowly weeding out the good ones. I’m also reading the owner’s manual for the Rebel XT as if it was the latest Dan Brown novel. I must have taken a couple of hundred photos over the weekend but have only posted a couple at Bombippy Photos. I’m becoming a lot more selective on what I post these days—quality over quantity. Even then, I know that these aren’t great photos but I’m learning. You get to watch if you like. Pogue took a bunch of photos in RAW format and couldn’t open them afterward. It turns out that and old shareware application, Graphic Converter can open the Digital Rebel XT’s RAW files. Maybe Adobe should hire them to work on their RAW plug-in support. If you’re interested in digital photography you may want to read Pogue’s review of digital cameras a from a couple of weeks ago. He has a slideshow comparing images shot with the Canon Digital Rebel XT and the Nikon D70S. CONTACT, the Toronto Photography Festival begins today. Among the many gallerys all over the city that are showing some great work, there are some public installations that you should look out for. David Byrne, former lead singer of The Talking Heads has several installations along Queen Street West in transit shelters. How cool is that? I can’t get no digital camera raw file support for my Canon Digital Rebel XT. It’s too new. Note: Adobe expects to offer preliminary support for the Canon Rebel XT and the Nikon D2X in May. What a drag. I shot a few photos today in just the “raw” format. I’ve since changed my camera settings to shoot RAW + JPEG (at the highest quality). I suppose I’m getting ahead of myself. Jason Kottke has posted the rest of his Paris photos. I particularly like this one. You just can’t get great baguette’s and cheese in Scarborough. All I have to do is look at a few photos like the ones he posted and I want to go back to Paris immediately. There are new photos on Bombippy Photos using the new Rebel-XT. In future, just check the VIEWING sidebar to the right. Under Recent Bombippy Photos you’ll find links to the most recent photos. This afternoon I visited Henry’s and picked up a Canon Digital Rebel XT (Canon EOS 350D). This is a beautiful 8 megapixel, digital SLR camera. I’m sure it will make it a lot more easier for Lissa and I to take our photos and publish them to our sites. I also plan to use the camera for some of my design work with JAK MEDIA. For the photojunkies out there, here is a breakdown of the camera. I also received a $100.00 gift card that can be used at Henry’s. I’d like to get a polarizing filter or maybe take a camera course on lighting. I’m pretty happy with the purchase and look forward to taking a lot of pictures with this baby. Thank you to David Duchemin for patiently offering advice and tips in terms of what lens and accessories I should purchase. He’s a professional photographer and has some fantastic photos on his site. Looks like Jason Kottke is in Paris this week and he’s posted a bunch of photos. It’s kind of weird seeing photos of places I was standing in a month ago. It’s interesting to see how different everything looks now as well—the leaves are out, the tulips are in full bloom and more people are sitting around in the parks. I can’t wait to go back. I just hope it doesn’t take another 15 years. Bombippy Photos has launched. I posted 27 photos of our trip to Paris last month. I’m using Movable Type 3.15 to power this new photoblog. A thumbnail gallery will be available in the archives section where you will be able to view photos by month o category (Paris vacation, nature, architecture, people and so on). I have to figure out a few more plug-ins before that happen. All shots were taken with a Canon Rebel and painfully scanned with an Epson Perfection 1260. Lissa took a number of the photos and these are noted in the photo descriptions. For now, enjoy the Paris photos and bookmark Bombippy Photos. Once I pick up a Canon Rebel XT I’ll be taking a lot more photos. The photos from our trip to Paris are coming. I have 20 scanned in, cropped, tweaked and ready to go. There are about 10 other photos I’d like to scan in before I post anything. Tedious work. Spacing and the Toronto Free Gallery have a photo exhibit of Toronto’s urban landscape and public spaces. PUBLICity is on now until April 23 at Toronto Free Gallery (660 Queen Street East). This is about 5 minutes from office and wil be a great place to take a couple of coffee breaks over the next couple of weeks. Lissa and I took our Canon SLR to Paris and took some photos. I’m hoping that there are some interesting shots that I can post next week. I would love to get a digital camera and be able to experiment more and possibly create a photoblog on Bombippy. In the meantime, I’ve been researching digital cameras, visiting way too many photoblogs and taking more pictures than usual. I woke up at 5:30 AM this morning so that I could watch the sun rise over Lake Ontario from the Scarborough Bluffs and take some photos. The light is incredible at this time of day and makes everything look interesting, including the guy that was driving his Hummer like a maniac across the public beach at Bluffers Park. He was a little startled when he saw me with my camera and took off. It’s funny how you start to look at the world differently when you have a shutterbug. I’m constantly looking for something that would make an interesting photo—landscapes, light, clouds, buildings. Everything starts to look interesting and if it doesn’t I try to look at it in a way that I haven’t before. I’ve been inspired by the photos at Fearfully Human and A Walk Through Durham Township. Hopefully in the next little while I will find the time to continue taking pictures and share the decent ones with the rest of you. Alison Hladkyj, a fellow designer has launched her personal website called LALALAND. She’s encouraging people to submit their digital photography. Each day there is a new photo and each month there is a different theme. The site is beautifully designed. Go have a look.